Прочетете този пост на български език. As you might have noticed from our excessive posting on Instagram for the past week, we went to Barcelona! Yep, Lina, our mom and I decided to take a long weekend to the popular Spanish city. We wanted to see as much as possible and feel the local vibes, so brace yourselves, this post will be long and with a lot of photos of our super busy three day schedule! Also, I’ll try to share some tips on what to see and what you can pass on, accomodation, transport and everything that a tourist might want to know! I’ll be brief here as there are many options to get to Barcelona depending on where you come from. Generally, the cheapest way is with a low-cost airline but don’t just check the flights to Barcelona El-Prat but also closeby airports. Lina and our mom flew from Sofia to Valencia and stayed there for a few days prior to our meet up in Barcelona. From there they took a bus for about 4 hours, which cost around 35 euros per direction. As for me, I took a flight from Eindhoven to Girona, which is about an hour and a half by bus from Barcelona and costs 16 euros. On my way back I flew from Barcelona El-Prat directly to Rotterdam (Transavia flight), which was much more convenient. Once again we turned to AirBnb for accommodation, where we found a great place closeby Plaça d’Espanya. I’m not gonna get into details about that, I’m sure you all know how to find a reliable accommodation through AirBnb (always look at the ratings!). I would recommend the first three but bare in mind that both Park Güell and La Sagrada Familia were extremely overcrowded. We didn’t even consider going inside, the queues were going for hours and the place was swarming with people. So go check it out from a distance, it’s pretty but also still unfinished. 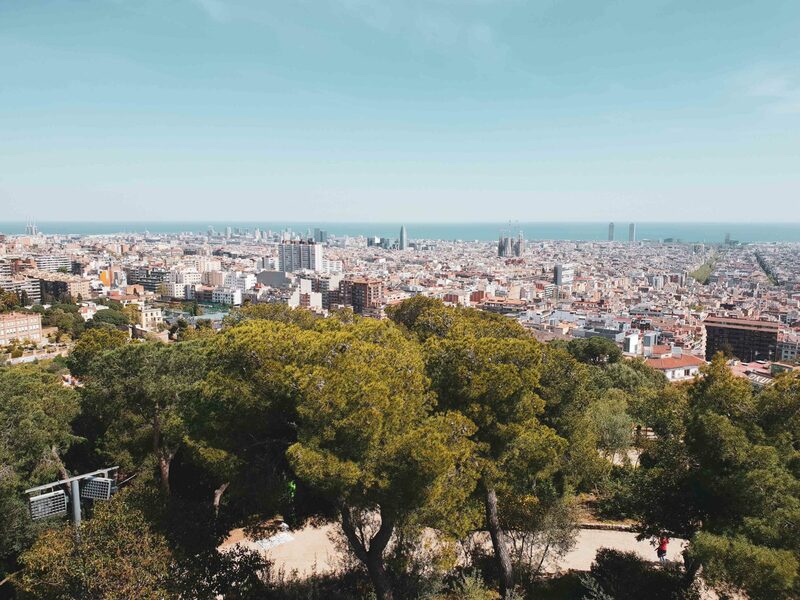 As for Park Güell, again full with people but when you have time constraints this place combines some interesting architecture with a beautiful view over Barcelona. However, if you’re on the hunt for the best view you should check out Bunkers del Carmel and Tibidabo as they’re supposed to be the best spots. These two neighbourhoods are a must visit in the city! The tiny little streets and lovely building facades are so beautiful and mesmerizing that you will find yourself walking around for hours. Plus, it doesn’t feel so crowded there. In the Gothic Quarter you will find the Barcelona Cathedral, Palau Güell, the famous kiss street art wall, my personal favorite Plaça Reial and a lots of other cultural spots. La Ribera is a bit more hip in terms of bars, shops and restaurants, so you will definitely find something for your taste there. Closeby is the Parc de la Cuitadella, which we really enjoyed – it was much calmer in terms of tourists and there were a lot of beautiful sights like the lake and fountain. So we definitely recommend it for a walk. When you finally find yourself close to the sea, have a walk down Port Vell and enjoy the sunset reflecting over the water. One thing you should avoid at all costs is the super overcrowded mall as it’s usually the main place for pickpocketers and muggers to target tourists. As for La Barceloneta, we went down this neighbourhood when the weather was a bit gloomy, so it wasn’t full with people and we could actually enjoy the little streets and lovely buldings around us. The beach itself is probably nice to hang out when it’s sunny and warm but unfortunately we didn’t get that chance. We didn’t have enough time to explore the Spanish cuisine as extensively as we wanted to but we still managed to discover a few nice places. Almost at every cafe or bakery you would be able to find a deal on coffee and a croissant in the morning. We tried a few different ones that were close to our apartment but those that we managed to remember were Panda Bar and Cafe Orion. You can always try out a magdalena (a bigger muffin) from a bakery close to you or maybe a tortilla (omlette with potatoes and onions), which we fell in love with. One place that you should not miss out on during your visit to Barcelona is the food market Mercat de la Boqueria!! You can get to there through the horrific La Rambla street, which is super busy, so be careful with pickpocketers (the same applies for the market itself). There you can find a great variety of fresh vegetables and fruits of all kinds, seafood, pastries, tapas, candy and so much more. We were mesmerized by the colours of the fresh fruit juices all over the place and after trying out a couple, I can recommend those that contained coconut e.g. with blackberry, ananas or mango. If you’re okay with the crowd, you can have a meal at one of the tapas places there and make sure to try out a tortilla somewhere along the way. We didn’t like that option, so we got a few empanadas (typical pastry with various fillings) and some delicious desserts like glazed dates filled with hazelnuts, pistachio and orange slices. As you know tapas is a big thing in Spain, so it’s a must for your visit. Fried calamari, patatas bravas, olives, anchovies and chorizo are just a few of the various dishes available. Next, you won’t go wrong with a paella, we chose a seafood one and were very pleasantly surprised. Along the course of your dinner (and why not your day?!) treat yourself to a nice glass of wine or sangria. For dessert, I can’t really recommend anything as we were always stuffed after dinner but with our afternoon coffee we would always get churros with hot chocolate, which is definitely a must!!! If you liked this travel guide, you can check the posts about Berlin, Copenhagen and Rome.